In 1845 Orlando Smith discovered a granite outcropping at the Babcock Farm in Westerly, Rhode Island. 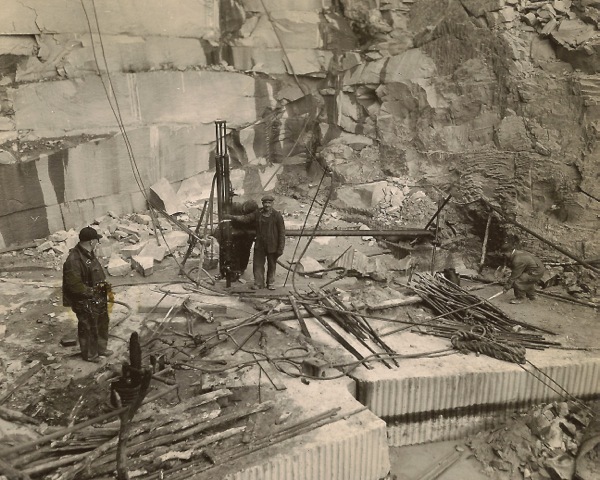 He purchased the farm and started the Smith Granite Company, the first of several companies in the area that quarried the now famous Westerly granite. 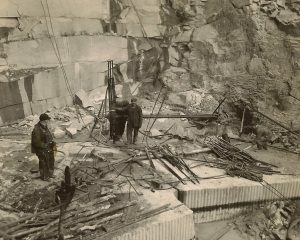 The granite was used for everything from humble curbing to skyscrapers to monuments for the Civil War dead and mausoleums for Gilded Age robber barons. The Babcock-Smith House is the home of Orlando Smith, next door to his original quarry. The Smith Granite Company thrived following the Civil War, when there was a great demand for the granite to build post-war monuments. There are sixty-nine monuments built by Smith Granite at Gettysburg, and more at other battle fields—Chickamauga (38), Antietem (8), and Vicksburg (1). In the latter part of the nineteenth century, Westerly granite was the stone of choice for wealthy individuals for their mausoleums, including Jay Gould’s in New York’s Woodlawn Cemetery. Today, the restored Babcock-Smith house interprets the story of the families who lived there. 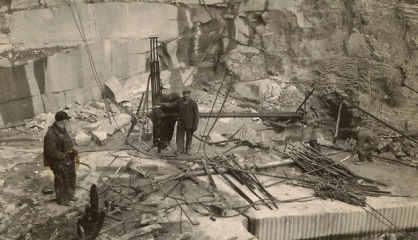 The museum’s collection, however, emphasizes the tools and ephemera of the granite industry in Westerly. Among the items are the order books of the Smith Granite Company, which describe in detail the design of the work, the stones that were cut, the names of the workers, and the cost of stock and labor. The order books will be on display during the meeting. The day will begin at 8 a.m. with tailgating in the museum’s parking lot. Coffee and doughnuts will be available, and at 9 a.m., attendees will divide into groups for tours of the house, viewing of a DVD on rock drilling and a trailer of the recent PBS documentary on the Westerly granite industry, and a walk-through of the museum’s vault where the order books are located, as well as a tour of quarry industry tools (including some “whatsits”) in the museum’s basement. Following the box lunch in the Babcock-Smith Carriage House, Paul Wood will speak. After his talk and a Q&A, there will be walking tours of downtown Westerly and the River Bend Cemetery where many of the works produced from the local quarries may be found. Cost for the day is $18 for EAIA members, and includes the lunch and the museum tours and all the other activities. Deadline for registration is April 10. Use the print form here to register via mail or the paypal button below to register online. NOTE: This even has occurred and the paypal registration information has been removed. Westerly is close to Mystic, Connecticut, and the Mystic Seaport Museum, and lodging is available there and in nearby Stonington, Connecticut.